— A rare late hydrothermal mineral formed in granitic pegmatites (Anthony et al., 2001—2005). One of the rarest gemstones. Jeremejevite — specimen 0586 — weight: 0.14 ct; shape: oval. Very clean specimen; very good mixed style cut. Source: John Bradshaw, Coast to Coast Rare Stones International. The section ‘Classification’ presents descriptions of 171 different kinds of natural gemstones (106 mineral species). The Nickel-Strunz systematic order (10th edition) is used. Specimens of the classes shown below are currently available. Since gemmology does not always follow the systematics of minerals in naming, many popular varieties or just ’names’ are also listed. — A rare accessory mineral formed in boron-rich skarns at the contact of limestones with granite or gneiss (Anthony et al., 2001—2005). 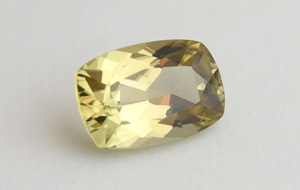 Faceted specimens are relatively rare. 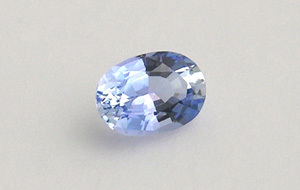 The largest faceted stone is a 158 carat from Sri Lanka (Arem, 1987: 173). Sinhalite — specimen 0150 — weight: 1.43 ct; shape: cushion. Very clean specimen; very good mixed style cut.